The creators of All About Spelling have done it again! For those of you that don't know, All About Spelling is possibly the best spelling program you can purchase. This multisensory award winning curriculum teaches one concept at a time and stresses continual review. All About Learning Press has taken the concepts that made All About Spelling so great and created a phonics and reading program. 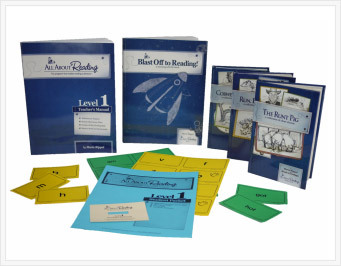 All About Reading 1 is a complete multi-sensory program. Your child will be actively participating in the learning process through sight, sound, and touch. The program is taught with no gaps using the five key components of reading: phonological awareness, phonics and decoding, fluency, vocabulary, comprehension.You child will gain the skills and confidence necessary to become a successful reader. Although Henry was already reading when we started this program, I felt that the reinforcement he received from completing the lessons advanced his reading skills tremendously. The hands-on method of teaching allowed him mastery by experience. I was completely amazed by how fast he gained knowledge and expanded his reading confidence. It was no longer enough that he knew that the "oa" in boat said "oh," he now understood why it said "oh." In addition to the magnetic letter board, there are lots of great extras that go along with the program, like the flip book Henry is using above. These add depth to the lessons and offer additional practice with the skills. Oh! I really like that school work because of all the magnets. Also, you don't have to write a whole bunch of letters like the other one. Why don't we do that program more? Can we do it now? CLICK HERE TO ORDER AND HELP SUPPORT OUR ADOPTION! All About Reading 1 can be purchased on the All About Learning Press Website for $99.95. This complete set purchase prices allows you to receive the Teacher's Manual, Student Packet with Activity book, and three Leveled Readers. Items can also be purchased separately. I was so impressed with the All About Reading Level 1 program that I went ahead and purchased the All About Reading Pre-Reading Program for Margaret. This program is specifically designed for preschool and pre-k aged children. It follows the same format as Level 1. Lessons are engaging and manageable for both the teacher and the student to accomplish. Margaret adores the program and asks for it often. I like the fact that it stresses mastery, but in a very relaxed way. Margaret learns without the stress normally associated with a phonics and alphabet program. Thinking of ordering? Please consider ordering through the links above and below. I am an All About Learning Press Affiliate, and this means that purchases made through the above and below links will earn me a commission. I have the account tied directly to our adoption fund. So all purchases will go directly to support our adoption efforts! Please consider supporting us! Disclaimer: As a member of the TOS Homeschool Review Group, I received All About Reading Level 1 free of charge in exchange for an honest review on this blog. I received no other compensation. I have recently been introduced to All About Spelling by a local friend and I am very interested. Would you please explain the difference between teaching spelling and reading? Are they to be taught simultaneously in this program? One after the other? What would I buy for my 5-year-old starting Kindergarten? If I buy, I will definitely buy through you! All About Spelling and All About Reading both use the same sequence and the same phonograms. Both are complete phonics programs, so they are interrelated in that way. AAS teaches words from the spelling angle, and AAR teaches words from the reading angle. For this reason, the programs are also independent of each other so students can move as quickly or as slowly as they need to with each skill. Kids generally move ahead more quickly in reading, and we don’t want to hold them back with the spelling. Marie recommends completing All About Reading Level 1 first, and then adding in the Spelling program. This way students get a solid start in reading first, and have a strong basis for spelling as well. I hope this helps! All About Reading and All About Spelling both use the same sequence and the same phonograms. Both are complete phonics programs, so they are interrelated in that way. AAS teaches words from the spelling angle, and AAR teaches words from the reading angle. Merry, thank you for the explanation. I was just checking back here to see if there was an answer because I really am interested in the program! Katherine Lauer recommended I check out this review because I have been interested in this program for a year now for my son. But didn't know anyone who could personally recommend it (I saw it at a conference last spring). My son is a bright, newly 4 year old. We have done almost no formal schooling yet. He knows all of his letters solidly and he knows their basic letter sounds solidly (doesn't know phonics...just knows A says ahh sort of thing). He can sound out words, but then can't put it together to read. So he can say "cahh-ahhh-taaa" but then can't tell me that he sounded out cat. So would I go with the preK program or the level 1 program? Does either program require any writing for the child? Not sure how I posted 3 times here, sorry about that! I must have thought it didn't go through. Neither pre-1 nor 1 require handwriting, so you'll be ok there. Knowing letters and sounds is an important part of learning to read, but not the only skill. Marie researched extensively & found that 5 main skills are needed--Print Awareness, Phonological Awareness, Letter Knowledge, Listening Comprehension, and Motivation to Read. Sometimes that Phonological Awareness part is the tricky part for kids, but that helps them bridge that gap from pre-reading to reading. So, it could be that the Pre-1 program would be of benefit even though your son knows letters and sounds. Here's a checklist that can help you know for sure which one to start with: http://www.allaboutlearningpress.com/is-your-child-ready-to-learn-to-read If he's only missing a couple of things, you could probably start with 1, or spend a few weeks trying to work on those skills and then start 1. If he's missing several, then you might consider Pre-1. I hope this helps!